Perfect World Entertainment was formed to manage the Boogie Knights and now has several disco bands worldwide under its management. 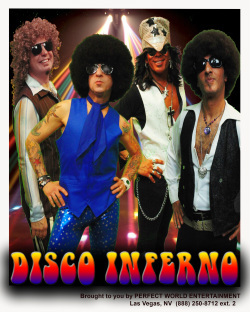 Disco Inferno performs over 150 shows a year regionally and across the nation. We have branded T-shirts, Posters, Mugs, Glassware and much more on sale now. Below is our live Facebook feed. Please like and share with your FB friends.